The South Korean government will expedite large-scale infrastructure projects worth a total 17.5 trillion won ($15.5 billion) funded with private capital to aid jobs and economy, the ministry of economy and finance said Wednesday. 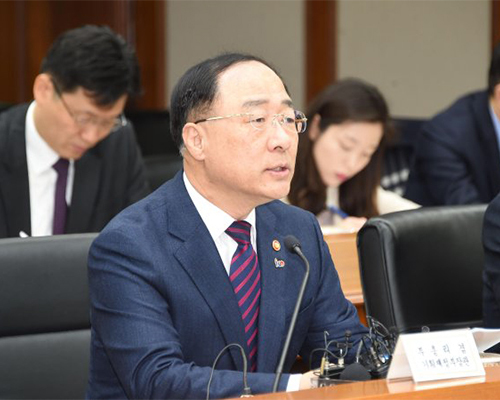 During economy-related cabinet meeting on Wednesday, Hong Nam-ki, deputy prime minister for the economy and finance minister, announced government directions to propel private investment projects. Under the plan, the government will license early construction of 13 large-scale private investment projects worth 12.6 trillion won by moving up the period from after 2020 to this year. The move comes as part of efforts to contribute to boosting national ailing economy by swiftly promoting large-scale transportation projects that have been delayed due to environmental effects evaluation and resident complaints. Among the fast-tracked projects are the 1.8 trillion won Gwangmyeong-Seoul-Gwangmyeong expressway, 4.1 trillion won new Ansan line double track railway, and 3.7 trillion won Pyeongtaek-Iksan expressway projects. The government gave green light to the Gwangmyeong-Seoul expressway project in February, last year, but construction has been put off as approval for some sections were suspended due to resident complaints and delayed agreement by local governments. The Pyeongtaek-Iksan expressway project was proposed by the private sector in 2014 and an enforcement agreement was signed in February, 2017, but construction has been delayed due to discord in environment effects evaluation. The government, meanwhile, also said it will launch early construction of 11 private investment projects worth 4.9 trillion won by an average 10 months so that construction begins this year instead of next year. It will also intensively manage major projects and introduce a stage-by-stage limit in overall construction timeline. Construction period for 6 projects including Yongin eco-town, Wirye-Sinsa line, and Osan-Yongin expressway will be reduced by up to 21 months.